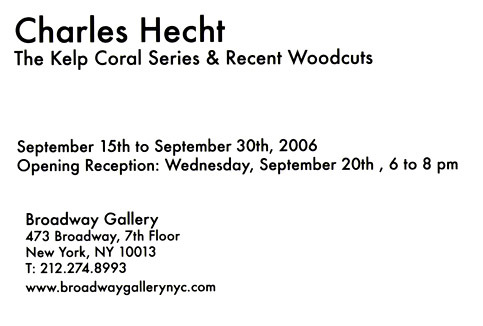 Exhibit Scheduled to Run from September 15th to September 30th, 2006 NEW YORK, NY � September 12th, 2006 � Broadway Gallery (473 Broadway, 7th Floor, New York, NY 10013) is pleased to announce the opening of Charles Hecht�s new exhibit, The Kelp Coral Series and Recent Woodcuts, featuring a number of his sculptural works created in China and in other locations internationally. Scheduled to run from September 15th to the 30th, the collection will feature the artist�s woodcut series created recently while in China as well as his kelp sculpture series. The artist is renowned for his large-scale public art, but, this time, his work will be shown inside closed doors at New York City�s Broadway Gallery. Of his Kelp Coral Series, Charles Hecht has explained, �This series is a continuation and modification of my previous Sea Pinnacle series. Kelp flourishes off the California coast and is probably the fastest-growing marine plant. I have combined the texture of the coral used in the Sea Pinnacle series with the feeling of rapid growth of kelp to create a true hybrid. I also wanted to convey the movement of the �kelp coral� with the changing currents of the ocean and the feeling of the openness of the ocean that a diver normally experiences when diving in the kelp fields off the coast of Southern California.� The artist�s sculpture is intricate, jagged and glistening. It is at once hostile, wet and enticing. also venturing into new formats such as the example of his woodcut series. As Hecht has proclaimed before, �To express a concept or sensation, the artist should not be afraid to explore the use of new techniques and new materials.� In this October solo exhibition at Broadway Gallery then, Hecht proves his artistic adventurousness in full.